"Thanks for the great teamwork. I personally appreciate it. We could not have done it without your(mcwane) help. "Best of all, however, is the fact that ductile iron poles offer a unique combination of high value, incredible strength, light weight, durability and flexibility. They can be loaded to yield strength without any damage to the pole. And they will not deteriorate like wood or concrete. Replacing a pole is expensive, and the labor outweighs the cost of the pole. Ductile iron poles are still new to FKEC, and the industry, but they are more cost effective and do the job better than anything else the utility has come across. FKEC expects them to last a long, long time." 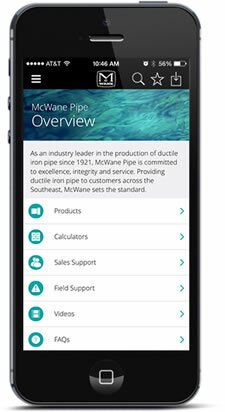 "McWane poles are much easier to work with. Only his two biggest line trucks can install concrete poles. This causes a backlog of work for pole installations. With McWane Poles, every line truck can perform an installation. When drilling concrete poles, issues include drilling into reinforcing steel and drilling out large pieces of concrete when the bit exits the pole." "After a large Hickory tree fell on a power line breaking wooden poles on either side of McWane’s ductile iron pole: 'Our guys are singing the praises of this pole. All the insulators were stripped off the pole, but they didn’t think this pole moved one inch. And the ground around the pole was completely undisturbed. I don’t believe that any other pole we use in this application would have survived undamaged like this one did.' "